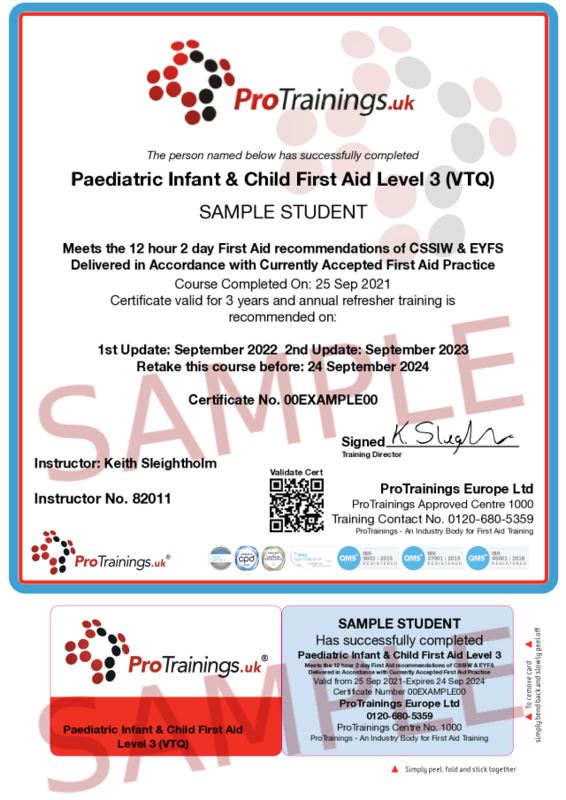 Level 3 Paediatric First Aid requires 2 days in a classroom to complete the Course – If you want to save time in the classroom but still meeting the required hours, we offer a blended version where you complete half the course using our video online training then attend one day in the classroom. This ProTrainings course meets and exceeds the requirements laid down by Ofsted, EYFS, CSSIW and SureStart for people needing a 2 day 12 contact hour first aid course for Infant and child. This group includes childminders and carers. The HSE recommend that all first aiders complete an annual first aid refresher courses and our online course meets this requirement. ProTrainings Paediatric courses are approved by most councils across the UK.